First impressions are everything, even for the first few pages in a non-fiction book. When The Universe Today Ultimate Guide to Viewing the Cosmos arrived in the mail and I took an introductory scan through its pages, I knew a lot of time was put into the production of its contents. While I was already well aware of the authors before this book was published, I was still impressed with the depth of knowledge this book provided. There are lists of reference materials for each topic anchored by beautiful images and additional supporting material. Since the book is about getting started in becoming an amateur astronomer, most of the material is technical in nature, but it does an excellent job of introducing each topic, highlighting keywords, and even adding a bit of historical context into discoveries that are just waiting for you to view through your telescope. The greatest benefit of the book is its easy bite-sized readability of a range of resources. Need advice on selecting a telescope? There’s a section for that. Curious to learn what celestial objects are the best to view on a particular date? There’s a section for that. Want to better understand night time lighting conditions? The Bartle Sky Scale helps here. Is it your first time exploring astronomical… anything? There is even a section on how to build your own telescope, or simply what to look for when purchasing one. The entire book eases you into each concept, but doesn’t linger to bore those who are already knowledgeable about the concepts. The Universe Today Ultimate Guide to Viewing the Cosmos is not a casual novel, it’s a long-term resource. One thing I hoped to find in the book was the date for the next total solar eclipse over North America. I conveniently found it on Page 65 along with dozens of dates for not just solar eclipses but lunar ones as well, all that will occur around the world over the next several years. Succeeding pages also gave me handy eclipse resources to prepare for my future viewing experience. All of the topics in the book had a similar presentation. I regularly have fun in identifying the solar system’s planets in the night sky. The great part about viewing these objects is you sometimes can get away with viewing them using a simple pair of binoculars. The book briefly talks about each planet, where it is in the night sky, and how (and when) to best view them. Comets, asteroids, planetary moons, and other objects are of coursed included. As you flip through the pages of local astronomical objects, it transitions to interstellar objects like other stars, the Milky Way’s globular clusters, the (relatively) nearby Andromeda Galaxy, and the many galaxies beyond. Catalogs of these objects are referenced with a bit of history talking about how the whole enterprise of astronomy got started hundreds of years ago. I was intrigued to learn that the first catalog, the Messier Catalog, was created by Charles Messier (born 1730, died 1817) from frustration in continually coming across “fixed fuzzy patches in the sky” that he thought were comets, but now we understand that they are entire galaxies. Truly a great guide on how to get started in observational astronomy. Whether you are already an amateur astronomer looking for more viewing material and an updated telescope, or starting from scratch and need advice on everything, this guide is your perfect resource in peering across the cosmos. Use the book to find a nearby viewing party, bring your new telescope, this book of course, and have fun! To add a little spice to my upcoming book about life, civilization, and the universe, each chapter is kicked off by a quote from a great thinker from civilization’s deep history. These quotes closely tie into what you will be reading throughout the chapter. Here they all are in one scoop! I hope you like the quotes that I chose! Stay tuned for more about the book in this regular blog series. As the podcast is rolled out later next month, I will add more related juicy posts here. Meanwhile, if you like what you see in this book’s premise and these associated updates, I would greatly appreciate support by following @OurCosmicStory on Twitter and Facebook. Thank you! Humanity lives in a unique moment in history. No civilization on Earth before us has experienced existence in quite the same way. The Mayans, Norte Chico, and Olmec never had our level of education, medicine, and security, not to mention the endless variety of entertainment options at the push of a button. If we could go back in time and experience what the lives of individuals in those early civilizations were like, we would probably be quite content to continue in the present with our air-conditioned homes and indoor plumbing. Each one of us is a unique thread of existence woven into a vast tapestry called civilization. This tapestry of humanity tells the story of an entire species’ monumental effort to understand and explore its place in the cosmos. All that we have ever learned is contained on this single planet in computer archives, shelved in vast libraries, painted on ancient cave walls, and shared through stories passed down from one generation to the next. This knowledge is worth preserving for future generations of explorers and great thinkers. We have a duty to all who came before us to act now to counter the threat of countless events that would guarantee our swift destruction, and erase all of our great history. To ensure that as many of those threats as possible are mitigated, we need to keep developing new technologies, secure the world’s infrastructure, and educate the public in science. The dinosaurs didn’t stand a chance against the asteroid that struck them. Humans also almost went extinct before – some say we got down to just 40 breeding pairs – after the supervolcano Toba erupted 72,000 years ago. In the past, humanity didn’t have the capabilities to prevent or dodge these calamities. Now we do. A diversified residence in the Universe is the ultimate solution to not only humanity’s quest for survival, but also our ability to expand our experiences. Residing on multiple worlds would significantly reduce the risk of any single event wiping out everything we have created in one catastrophic blow. The greatest realization of the lofty goal of colonizing space is that it is entirely possible to make happen. We only need the will and focus to get it done. Are there alien civilizations that have transcended the struggles that are a part of being an evolving species, and have successfully expanded beyond their home planet? We could learn from them, and perhaps they could learn a few things from us in return. The seeming emptiness of space would not be so empty if we knew of each other. If there are indeed other civilizations out there, it would be smart to present humanity in the best possible way. The scientists leading our quest into space are generally some of the brightest, most noble humans that can represent our ideals. If humanity one day ventures out to explore other star systems, only to discover worlds in ruin that once hosted thriving civilizations, then we should pay tribute to those civilizations and ensure they are remembered. Whatever evidence we can gather of their existence must be studied. And where an extinct civilization is found, a monument should be created there that preserves their identity and way of life, so that future generations can learn from their achievements, and their mistakes. If dead worlds are indeed all that exists in our cosmic neighborhood, then perhaps we will have to adjust our hopes that a civilization could last for eons, and that we will ever be able to share our experiences with another intelligent species. We might have to accept that a more realistic goal for all civilizations is merely to live well and discover what they can, alone, in the time available to them. Fate may yet deal us this most dire of cards as we attempt a journey to the stars. Someday humanity might fall back to a primitive society here on Earth, perhaps forever. If we at least did our best to establish a unified civilization that reached as far as it could into the depths of space, then maybe that is all that counts. Perhaps it will be some alien visitors eons from now that memorialize our once great civilization. They may honor the efforts humanity made to better itself and reach other sentient creatures that were indeed there, but just out of reach. The editing phase for Our Cosmic Story is nearly finished! To celebrate this upcoming milestone, I am releasing the introduction to the book here as a blog update. I would love to hear what you think of it. Enjoy! It is rare that we get a chance to reflect upon life, to smell the roses or to look at the cosmic picture. Yet it is important to find the time for such reflection when the grand cosmos is on our doorstep. How did life appear on Earth? How did our fantastically complex civilization develop? When will we encounter other civilizations out there, if ever? This book will explore our history and place in the universe, examine why Earth is so hospitable for life and civilization, and consider the likelihood for life to exist on other worlds, some that may be far more different than our own. The quest to reach beyond the confines of our world is a natural consequence of being a very small part of a grand and dynamic universe. Looking up at the sky instills within us some expectation that we are not alone, and we wonder if there is not something amazing happening out there somewhere. This sense of awe may not be exclusive to Earthlings; for in a galaxy truly far away, there could be creatures with similar musings as they peer towards our corner of the universe. The idea that we share this existence with potential aliens is a recurring theme in this book. Regardless of the possibility of countless other life forms existing on rocky barges adrift throughout the cosmos, we should still hold the belief that humanity is special. Our world is rare enough that we may appreciate it just as much as if we are in fact alone. Recent studies have shown that, while life’s ingredients are common throughout the universe, the exact quantity and assortment of chemicals and minerals that make up Earth are unlikely to exist elsewhere. This may have significant consequences for life and evolution on another world that’s close in properties, but not quite the same as Earth. For a close-to-home example, both Mars and Venus can be considered distant cousins of Earth and once thought to be habitable, though you wouldn’t want to book a vacation to either of them anytime soon. While Mars and Venus are rocky bodies with solid cores, Mars today lacks a dense oxygen-rich atmosphere and liquid water on its surface because the planet is simply too small. Venus is nearly the same size as Earth, but is far too close to our scorching sun. There are many other variables of habitability to consider as well, many of which we will explore in upcoming chapters. The physical makeup of the Earth and how it compares to other planets in the solar system is an important starting point for understanding where we may find life elsewhere in the universe. Even though we may currently be well off on Earth, humanity should make every effort to voyage into space, if only for the practical reason that Earth will not support life forever. We may one day need to flee Earth in order to preserve the existence of our species from a variety of cosmic and terrestrial extinction events, like asteroid impacts and supervolcanoes. Currently, all of our proverbial eggs are dangerously in one basket. While the lack of evidence of life on other worlds may suggest at first that the endeavor to colonize space is futile, this is a dangerous assumption we just cannot afford to make. The act of colonizing space will of course come at initially great cost, but in the long run it may pay off in ways we cannot even imagine. Many great explorers like Christopher Columbus, Ferdinand Magellan and Charles Darwin risked their lives and boldly faced peril to sail across vast oceans in the name of science and discovery. Diseases and other formidable barriers attempted to stop them from making progress, but they pushed on in the hope that a better future lay ahead. These great explorers, and many great thinkers throughout history, have helped to lay the foundation of our civilization as it stands today. Whatever our future may hold, let us not forget where we came from or fail to cherish this home base. Protecting the Earth for as long as possible may be important for facilitating our ability to leave it someday – and perhaps in our need to return to it, should space be more unforgiving than we had realized. The Earth is not a place that we can spoil with the assumption that a better one will eventually be found. Assuming in advance that our existence in the cosmos is assured will be the ultimate undoing of our way of life. Many of Earth’s past civilizations made this arrogant assumption about their destinies, and it resulted in their swift demise. In order to begin to understand how we achieved all that we have so far, and further our chances of carrying our knowledge into space, there is one thing that must always be with us: a sense of hope and drive to improve the whole of civilization, beyond just our own lives. The motivation to pass down prosperity to future generations has the power to be a catalyst for expanding into a spacefaring civilization that can counter the constant threats against our one world. While great things will still be accomplished if we stay grounded to the Earth, it will be tragic if humanity one day forgets that we once long ago nearly made it to the stars, but did not. I hope that this book heightens your sense of wonder about our tiny but special place in the cosmos, as well as fires your imagination and intensifies your intrigue in exploring the potential for other worlds where human civilization may one day call home. The Oregon Trail was a popular video game when computers were just becoming available to the public in the 1970s. The most popular version of the game later arrived in schools on the Apple II in 1985. The game helped to raise awareness of the actual Oregon Trail in the United States which spanned from the eastern state of Missouri to Willamette Valley in Oregon. The trail extended about 3,500 kilometers (2,200 miles) at its peak use in the mid-1800s with over 412,000 settlers, traders, miners, and others using the trail to access rich farmlands and growing towns along the upper west coast. A half century went by before the Oregon Trail was completed and used regularly. Traversing the trail could take as long as 170 days, especially when traveling with children and heavy belongs that slowed down progress. If you were a pioneer in charge of exploring the west coast for farmland, the trail could be traversed in as little as 120 days. Completing the route today would take (also with considerations of sleep and other needs in mind) 14 days by pedal bike, 3 days by car, and a brisk (though still arguably just as uncomfortable) 4 hours by plane. The trail was extremely dangerous, even at its peak upkeep in the mid-1800s. The most dangerous part of the trek were the many rivers wagon parties had to cross. For every river traversed, another threatened to tear out a wheel axle, drown the helpless that fell off and were dragged under current, or cause illnesses and frostbite along rivers high in the mountains. Food had to be hunted and eaten on the spot before it spoiled. On many occasions, threats from Indians or even other wagon parties could spell doom for those traveling alone. Initial expeditions and journeys into new lands are nearly always a dangerous task, especially when the distances involved open up the opportunity for accidents, disease, and death to occur with no help in sight. As we advance in our knowledge of the dangers and ways to mitigate them, we not only create a safer path for others to follow, but faster to traverse as well. Airplanes are not only the safest way today to get from Missouri to Oregon, but by far the fastest. Every technological advance humanity has made over the last two centuries has brought us one step closer to that four hour reality we enjoy today. Outer space will provide a new frontier in exploring vast areas that are orders of magnitude in scale beyond the travel times of the Oregon Trail. The moon is on average about 384,400 kilometers from Earth, or about 120 times the distance of the Oregon Trail. Light travels at the blistering speed of 299,792 kilometers per second, yet it would still take over a second to reach the moon. Using the latest in-use rocket technologies, the fastest we could get to the moon is about three days. We could get there in a quick eight hours or less though if we didn’t care to slow down or stop for a visit. Three days is just a long weekend, which doesn’t sound so bad for traveling to such a cool place as the moon, until you scale distances up in magnitude. Using planetary gravity to slingshot a spaceship to higher speeds by hitching a ride around another planet’s gravity field, it still takes about ten years to get to the furthest planet in the solar system–Neptune. At Neptune’s closest approach to Earth, which is 4.3 billion kilometers away, it is a mind boggling 1.3 million times farther than the length of the Oregon Trail. Without rest and at the modest pace of 25 kilometers per hour (wagon speed), it would take 53,000 years to reach Neptune. 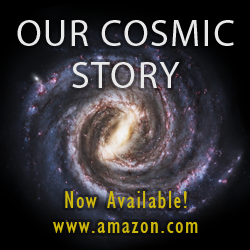 Our Cosmic Story – The Opening of Chapter 9, Is Anybody Out There? “Despite all that we have come to know about the universe, there is still so much left to understand about the probability of life elsewhere. There are many unknowns yet to explore, and surely just as many that we can’t even imagine, but we can start with what we know about Earth and the solar system to hypothesize. The gaps in our knowledge are being filled in with new data all the time, but scientists admit that there is a lot of uncertainty about what we might find. The solar systems we have discovered so far with the Kepler Space Telescope indicate that our own solar system is not the normal configuration of planets and other bodies one would expect. In fact, we have thus far detected no two similar solar systems. The galaxy contains a virtual zoo of various sizes, orbits, and compositions of solar systems. Some have massive Jupiter-sized planets hugging their parent stars, while many have a super-Earth. Others have no asteroid belt at all, and at least one solar system we know of has a massive asteroid belt many times greater than our own. There are even solar systems with four or more orbiting planets that could fit within the orbit of Mercury! Partly because solar systems are so diverse and not of the expected norm, detecting life on these other worlds is one of the most challenging things humans have ever set out to accomplish. Excitingly, we are just now developing the technology to detect the gases in the atmospheres of worlds outside our solar system, which will tell us a lot about any life there. Certain gases like oxygen and methane, especially in combination, can indicate the presence of life. Future generations of telescopes will greatly improve our ability to make more detailed observations.